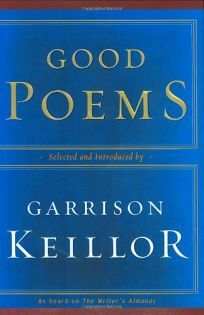 Poetry is a regular feature on Garrison Keillor's NPR radio show A Prairie Home Companion, but for the last five years, it has formed the core of The Writer's Almanac, a daily, five-minute, 7 a.m. show on which Keillor reads a poem. Good Poems selects 350 pieces of verse from among the thousands that have been read on the Almanac for ""Stickiness, memorability.... You hear it and a day later some of it is still there in the brainpan."" Divided by subject-beginning with ""O Lord,"" moving through ""Day's Work,"" ""Sons and Daughters"" and through to ""The End"" and ""The Resurrection""-the book includes work by writers past (Burns, Dickinson, Bishop, Williams, Shakespeare) and present: Robert Hass, Lisel Mueller, Tom Disch, among many others. Keillor will do a four-city tour in support of the book, and of the paperback release of his Lake Wobegon Summer 1956.